The most famous paella of all is the Valencian Paella, In Valencia, this dish is made like nowhere else. This typical dish has rabbit, chicken, beans and green beans, as well as a good sofrito made with tomato, onion, and garlic. The authentic Valencian paella is made over charcoal or wood fire, controlling the fire to have a lower flame and a higher one depending on whether we want to lower or raise the temperature. It is important to turn the paella pan around so that the whole base gets the flame and the heat is uniform in all sides, otherwise the rice in the corners will remain hard. I advise you to buy quality rice like paella rice. For the best seafood paella recipe go to home page and have a look in all the variety of paellas with seafood! Put the soaked broad beans in a casserole with plenty of water to boil over medium-high heat, and when it starts to boil, lower the temperature to low heat and let it cook for an hour and a half to two hours, until tender. After that time, add 2 teaspoons of salt and let them rest in the liquid for half an hour before draining. Chop the rabbit and chicken if the butcher has not already done so. Then season with 2 teaspoons of salt and black pepper. Next, heat the oil in a large paella pan and add the chicken and rabbit pieces. Fry the meat until golden brown on all sides (about 10 minutes). Add crushed tomatoes, chopped onions, chopped garlic, and washed and chopped green beans. stir all ingredients and let them sauté for about 15 minutes until the green beans are almost tender. Then pour in the water or broth and add the rosemary and put the heat at its maximum temperature and cover the paella pan with a lid. When it begins to boil, remove the lid, add 2 and 1/2 teaspoons of salt (if you add broth maybe is not necessary to add more salt) and saffron. Next, sprinkle the paella rice on top evenly so that all the grains are covered with liquid. Then add the drained broad beans and stir all the ingredients so that they are well distributed. Let the rice cook for 10 minutes over high heat, turning the paella pan so that the heat is evenly distributed. After that time, lower the temperature and simmer for another 10 minutes until the rice has absorbed all the liquid. By now, the rice should be al dente. If it is still a little hard, add more liquid and continue the gentle cooking for a few more minutes. To finish, turn off the heat, cover the paella pan and let it stand for 5 minutes before serving. Then remove the sprig of rosemary so that it does not fall on anyone. If you are not very skillful, it is preferable to ask the butcher to cut up the rabbit meat and chicken for you. 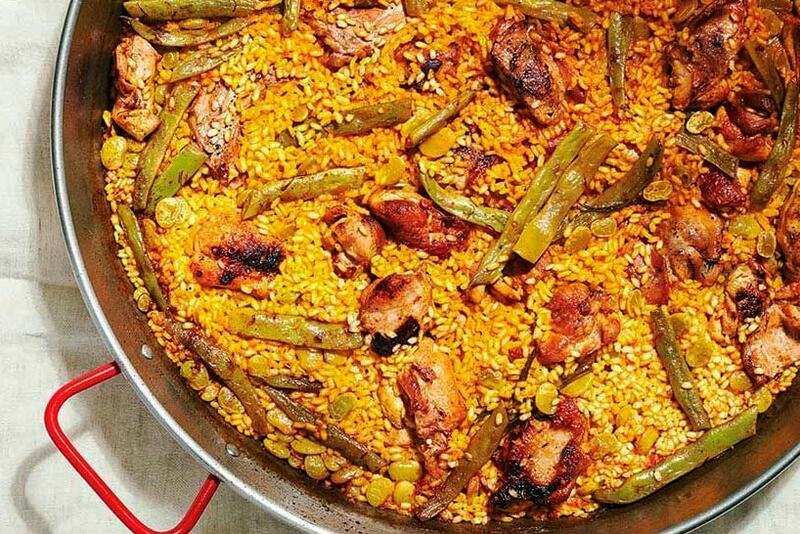 Have you ever had Valencian Paella before? It´s definitely one of our favorite! Very unique and very tasty!